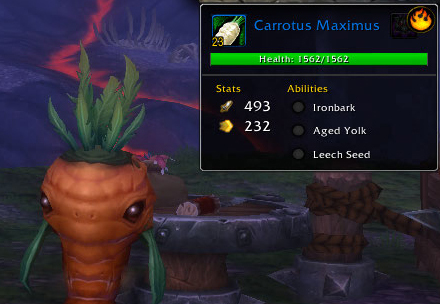 The third Pest in the quest Pets vs Pests (required to unlock your pet Menagerie at your level 3 Garrison) is by far the tastiest. 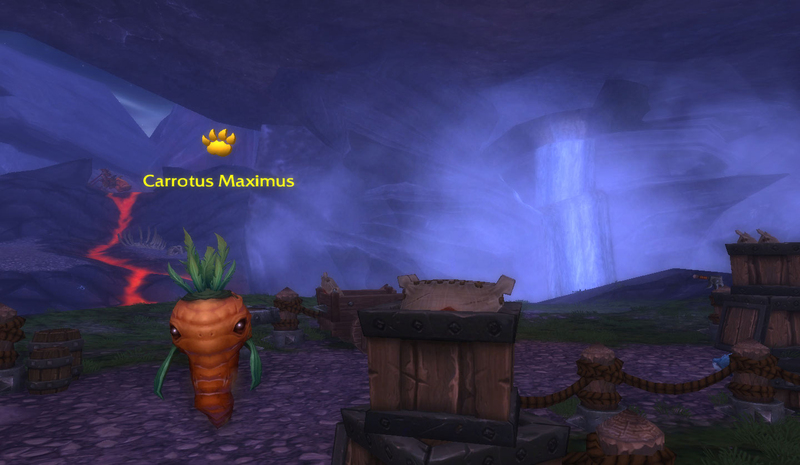 Carrotus Maximus can be found near the herb garden in both the Alliance and Horde Garrisons. Carrotus is the most challenging of the 3, in that you need to be a bit more aware of his attacks. That said, this is another relatively easy fight, so I’m going with a loose idea of what we’ll need more than a cohesive team. 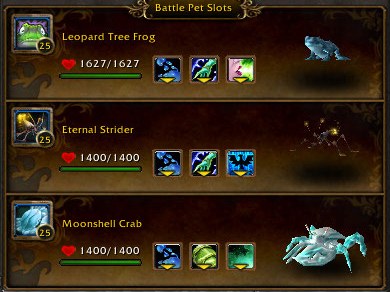 My go-to pet here is frogs, because they hit pretty hard, have a heal for longevity, and can turn Carrotus into a frog. Always a boon in single-pet fights. You can tame a high-level frog in a number of relatively easily accessible places, including much of Pandaria. Striders have the hard-hitting Aquatic stuff down pat, with a heal but no additional frills, also tamed across Pandaria. I don’t like most crabs here, but that Moonshell Crab from the Shadowmoon Valley coast continues to be a great pick. In general, as long as you’re picking Aquatics and use a main attack other than Surge you’re going to be in good shape. Carrotus’ moveset is unique. Peculiar, even. His only offense to speak of is Ironbark, which is why I’m so fixated on hitting hard. Ironbark applies a single-turn self shield a la Stoneskin, but with a lot more blocking power. Carrotus also uses Leech Seed to heal himself occasionally, but if you use an Aquatic pet, it won’ t heal him up as much. The wrinkle here is that Carrotus is relatively slow, and also has Aged Yolk, which he uses to wipe off his own Ironbark? I put a question mark there intentionally because it’s a little silly, but come on, what do you expect, great strategy? He’s a carrot. So, that buff & debuff thing means that a Strider is really well-suited here, because you can prime Pump while the shield from Ironbark is active, and then use Water Jet until Ironbark wears off. Because most pets are going to be faster than Carrotus, using a big skill like Pump when Ironbark is down is a relatively easy order. Just use big Aquatic hits, and Carrotus will go down easier than falling off a roof. This entry was posted in Uncategorized and tagged menagerie, strategy, Warlords of Draenor on September 12, 2014 by Liopleurodon. So I wasn’t worried about this one but I actually soloed Carrotus with Mojo…3 frog progs and yes he cleared his own enchant lol. 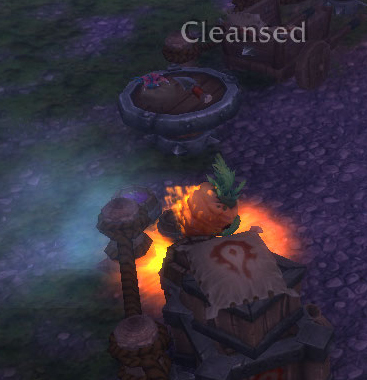 I was originally going to use Cleansing Rain to make the hits even harder, but the heal during a frog proc was better. Yeah, frogs are really good for this fight, doubly so if you get lucky & proc Frog Kiss’s mez. It’s important to note that the first couple hits of Frog Kiss won’t really do much, but the ability does extra damage each time you use it. I’ve seen a bit of confusion regarding this point & just want to clear it up.